Painting reflections and shadows is the key to realism. Cast shadows are the shadows an object makes on the surface it's sitting on or any vertical surface behind it. These help define the shape and give it dimension, they can also seat it firmly on the surface to make the painting more real. Reflected color from the object will go into the shadows and tone them. Also the color of the light will create some of its complement in some areas of the shadow. Any shiny object like the three cherries in today's painting will also have reflections on it. These aren't true to color unless the shiny object is a mirror or chromed object, and the shapes of the reflections will distort around a curved or angled surface. The colors will be muted and blended with the color of the surface they're on. I love black cherries. Sometimes I think they are my favorite fruit. It took real willpower to set these three out on a sheet of white printer paper to paint them rather than just popping them in my mouth to eat them. But I couldn't help noticing the interesting reflections the white surface made on them. The reflections curved up and around, then where a dimple in the cherry's surface caught light and shadow, turned into a neat little shape with an oval of the darker color under a curve. This is why it helps to either use a very good high resolution photo reference -- or even better, paint something from life. I started out with a quick line sketch of the cherries, placing them on the paper. I erased that sketch two or three times till I had the composition where I wanted it for the pahe as a whole. I was careful to outline the reflections on the cherries and the highlight spots from the incandescent ceiling fixture and the brighter, colder highlight from my Daylight lamp. HB pencil -- mine is a Dixon Oriole No. 2 pencil. All supplies are available at Blick. Clay Shapers are available in a set at Blick in size 2 or 6. Everything else is super cheap, I think it was less than a dollar for the box of pencils once the online coupon factored in. Start with a line sketch of the cherries. Go ahead, right click and copy mine if you want to work from my painting. Outline each of the color and value areas -- the reflections of the lights and the paper. There's even a reflection of the shadow on the underside of the cherries, that's the dark crescent under the reflection of the paper. Outline the shadows very lightly. The double light source is what made the shadow of that stem split at the end, it's a lighting effect. Since I was painting directly from life, I put it in. If you prefer to draw from your own fruits, choose any fairly shiny fruit -- a dark red apple, cherries, plums, and set them out on a white sheet of printer paper. Use two lamps, one brighter than the other, if you want to get the warm highlights make sure one of them is incandescent and the other one a daylight-corrected fluorescent bulb. Set your two lamps at different angles to the fruit and move them around till the highlights are placed in an interesting way and they're distinct. Part of the fun of this is seeing what shapes the cast shadows take when you have the lamps in different positions. You may get double cast shadows. That's a fun effect, just sketch the outlines of both lightly and continue the lines where they overlap, since the doubled shadow will probably be darker and have a different hue that mixes the colors of the separate shadows. Double shadows, usually the incandescent light will cast a blue-looking one and the fluorescent light an orangy one. On top of this, the color of the fruit will reflect into the shadows. You may also see a deeper, darker shadow right at the edge of the fruit. This was a little obscure when I set up my cherries but it's normally there. It's the area where very little light gets under the fruit but you're still seeing the paper. If you use a white plate to set up your fruit, you will very likely see a faint reflection of the fruit in the plate. Go ahead and paint that too, using the lightest matching or blended tints in your set of oil pastels. If you don't have Pentels, use Loew-Cornell or whatever brand you have. Get your sketch as accurate as you can. Then erase any wrong lines (I moved it three times) and use the kneaded eraser to lift it until you can barely see it. This is why I didn't scan my sketch, the scan would've shown nothing because it was way too light. I would trace it for you, but it seems my tracing paper pad is still packed. So print out the art and trace the outlines of each of the color and value areas yourself, it's good practice and you can do this with your own photo references too. If you set up your own still life, a good way to get the value changes is to turn the photo grayscale in your photo processing software and print out a gray scale version to trace from. Then check against the color one for color changes that are the same value. I started out by painting the bluer parts of the reflections on the cherries with a bright light blue, then modified that with gray and a pinkish dusty rose-violet light color. I mixed these colors till I had the hue (what color it is exactly) and value (how dark it is) precisely to what I saw. It looked silly with the rest of the cherries white. I sketched in the stems with a mix of olive green, yellow ochre and a reddish brown. Then I filled the shadows with a bright warm blue (slightly violet leaning) at the right side, where I saw a strong blue cast. I shaded from that with an intermediate brown that leaned toward orange, overlapping it slightly, without going heavy on any of these colors. I finished with a rich dark Indian Red on the left side of the shadows. Everything on the first layer on the shadows I did a light smooth tonal layer without visible strokes. I went over the shadow colors with light gray and then blended their outside edges with white. The real shadows had soft edges along most of their outlines. Then I filled in the cherries with the darkest bright red in the set, which has a cool bluish cast. I filled them solidly, then went over them with black heavily in the black areas, lighter in the places where the red shone brightest. I avoided all the highlight areas and reflections of the paper. I used white in the brightest white highlights and then went around it with the highlight mix. I blended yellow ochre, raw sienna (an orangy light gold color) and a bit of orange for the highlight from the incandescent light. Then I brought the bright red and black mix right up to the edge and blurred the edges of the highlights with the Colour Shaper. I didn't like the mottled look of the red-black mix, so I went over the edges of the highlights with light gray and went over all of the medium-value highlights with light gray. I then burnished over all the darks with the light gray and found that helped. I went back over the gray with both the black and the red for the strongest areas, and that blended the dark color smooth. Sometimes burnishing with a light color using strokes that follow the curves of the fruit can do wonders to break up the mottling caused by a mix that isn't mixing. So if you have trouble, remember even the red-black isn't pure and that burnishing over all but the white and orange highlights with light gray helped unify it. I went back with the black to strengthen the deepest darks and used the medium gray over all the shadow colors, blending them to about an eighth or sixteenth of an inch from the edge. I edged around the shadow with white, blending the last bit of shadow out into a soft edge with the white. Using white and light colors, I detailed and cleaned up the highlights, added a highlight on the tip of the stem to distinguish it and then used the Colour Shapers to blend everything. I touched up where any areas were patchy by adding more layers. Signed, scanned and ready to write, I started working on this page. So the key to creating realism in any still life subject is close, careful observation. Look at the reflections of the surface on the subject. Look at the way colors shift around in the shadows. Try to look at a little area independent of what it's supposed to be -- shadows are not flat blue or violet or gray, they reflect whatever's casting them and whatever's near them. 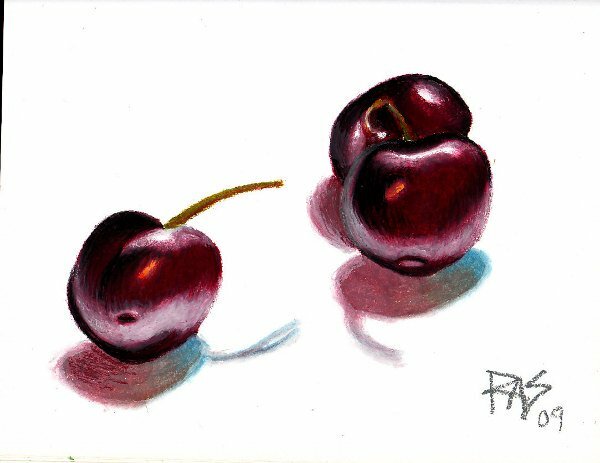 If I had wanted to create a still life painting instead of just a cool little study of cherries, I would probably have tinted the white and shaded it cooler as it receded to the back to further flatten the surface. White doesn't always look white, you would be surprised at how dark some of the shadows get on a white object. So try it on your own with a still life of your own fruit. We'll deal with cool shaded backgrounds and white on white variations in another article. For now, let's see if you can do some cherries or plums or apples that look like they pop off the page to amaze your friends. Enjoy!